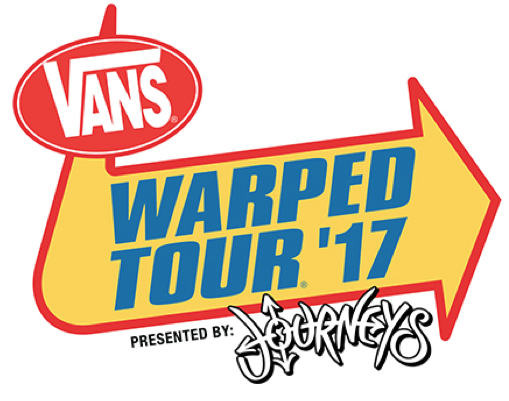 The entire lineup for 2017's Vans Warped Tour, presented by Journeys, will be unveiled via a LIVE webcast, direct from Full Sail Live, the state-of-the-art performance venue on the campus of Full Sail University in Winter Park, FL on March 22 at 6 p.m. EST. The webcast will feature live performances from a selection of artists performing on this summer's tour. Fans can tune into the webcast on March 22, via vanswarpedtour.com. A limited number of free tickets to the announcement event will be made available to the public. Space is limited, and will be available on a first come, first served basis. If you are in the Central Florida area and are interested in learning how to attend the event in person, visit www.FullSailBlog.com/VWT. "For the second year in a row Full Sail is honored to host the Vans Warped Tour Lineup Announcement on our campus," Full Sail University's VP of Alumni Relations/Event Producer Jay Noble said. "This event provides select students with the opportunity to participate in production roles allowing them to gain experience alongside artists that will be performing during the largest traveling music festival in the United States - Vans Warped Tour. Full Sail's relationship with the Vans Warped Tour has led to numerous internship opportunities for our graduates over the years and we look forward to more incredible experiences at the Warped Tour in 2017." Warped Tour founder Kevin Lyman said, "The entire team at Full Sail University was amazing to work with for the [artist announcement] event last year, so we are honored that they wanted to host the event again. After 22 years on the road, it's great to have partners like Full Sail University that believe in the tour, its message, and its success." Tickets for this year's tour will go on sale on March 22 at 10 a.m. local time at vanswarpedtour.com.